Up to the challenge? 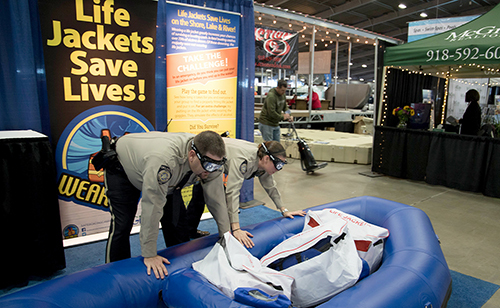 … GRDA Police Officers demonstrate the “life jacket challenge” at last year’s Tulsa Boat Show. The challenge will be back in place for the 2019 show (January 28 – February 3) and GRDA encourages you to drop by and check it out. If your plans for the very near future include a trip to the Tulsa Boat, Sport & Travel Show (January 28 – February 3), then the Grand River Dam Authority encourages you to stop by and visit us during that trip. As always, our GRDA Police Department and Lake Operations Team will be at the show, to answer your questions and offer information in hopes that your upcoming trips to GRDA waters (including Grand Lake, Lake Hudson, W.R. Holway Reservoir and the Illinois River) are safe and enjoyable for you and your family. The GRDA booth is always a good location to pick up information on lake rules, learn about upcoming events, such as the Kyle Williams Safe Boating Classes and simply ask any questions you may have about the waters under GRDA’s control. Also, our team would certainly like the opportunity to discuss life jacket safety with booth visitors and provide information on the different types of life jackets, as well as proper usage and fit. Remember, life jackets only work if you wear them. In fact, you can even take the “life jacket challenge” when you visit our booth! Since Grand Lake was first created in 1940, GRDA has, at no cost to Oklahoma taxpayers, patrolled, administered, managed and protected Oklahoma’s most popular water recreation destinations. Throughout 2019, we will continue to do just that. So, whether you plan to swim, ski, float, cruise, fish or just sit by the shoreline, the GRDA team looks forward to seeing you out on the water this year. But first, we look forward to visiting with you at the boat show. And, if you cannot make it to the Tulsa show, remember you can also visit the GRDA booth at the Mid-South Tackle, Hunting and Boat Show at the Expo Center in Grove, (February 15-17) and the Grove Boat Show (March 7-10). Headquartered in Vinita, GRDA is Oklahoma’s state-owned electric utility; fully funded by revenues from electric and water sales instead of taxes. Each day, GRDA strives to be an “Oklahoma agency of excellence” by focusing on the 5E’s: electricity, economic development, environmental stewardship, employees and efficiency.